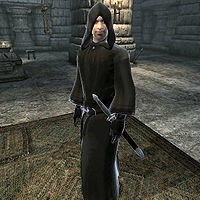 Lucien Lachance is an Imperial assassin and Speaker of the Black Hand, the core governing body of the Dark Brotherhood. His only formal residence is Fort Farragut, which is located east of Cheydinhal. He gives you the first Dark Brotherhood quest, A Knife in the Dark. Following the completion of the quest, he will visit again to instruct you on how to locate and enter the Dark Brotherhood Sanctuary in Cheydinhal. After completion of A Knife in the Dark, you do not receive further contact from Lucien until the quest The Purification starts, during which Lucien promotes you to the rank of Silencer. After completing The Purification, you receive instructions from him in the form of dead drop orders for two more Dark Brotherhood quests, Affairs of a Wizard and Next of Kin, after which the dead drops are intercepted. You will resume contact with Lucien at the completion of A Kiss Before Dying. At that time, Lucien informs you that both he and you have been deceived. He then initiates the quest Following a Lead, in an attempt to reveal the traitor before the remaining members of the Black Hand get to him; he will, however, meet a grisly end at his secret hiding place, Applewatch. 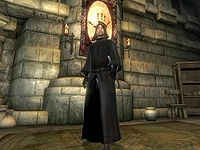 Lucien wears a Black Hand hood and Black Hand robe. He also carries a silver shortsword, a lockpick, some gold, and a set of spare clothing (laced leather pants, a dark green shirt, and stitched leather shoes). 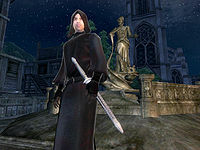 Once you have reached the final Dark Brotherhood quest and the second version of Lucien is activated (see notes), his possessions are limited to include only his robe, hood, sword, and a lockpick. At this point he is no longer a member of the Creatures faction. Gasp! Who are you? : "I am Lucien Lachance, a Speaker for the Dark Brotherhood. And you, you are a killer. A taker of life. A harvester of souls. Your work, your deathcraft, pleases the Night Mother. And so, I come to you with an offering. An opportunity... to join our rather unique family." Explain yourself. Now. : "In due time, dear child. In due time. First, an introduction. I am Lucien Lachance, Speaker for the Dark Brotherhood. And you, you are a cold-blooded killer, capable of taking life without mercy or remorse. The Night Mother has been watching, and she is most pleased. And so, here I am. I come to you with an offering. An opportunity... to join our rather unique family." Say nothing: "You prefer silence, then? As do I, my dear child. As do I. For is silence not the symphony of death, the orchestration of Sithis himself? Ironic, then, that I come to you now as Speaker for the Dark Brotherhood. My name is Lucien Lachance, and my voice is the will of the Night Mother. She's been watching you. Observing as you kill, admiring as you end life without pity or remorse. The Night Mother is most pleased... That is why I stand here before you. I bear an offering. An opportunity... to join our rather unique family..."
"Ah, I find your etiquette refreshing." "Then heed my words, for I will not repeat them." "So, I have your rapt attention. Splendid. Now listen closely." "On the Green Road to the north of Bravil lies the Inn of Ill Omen. There you will find a man named Rufio. Kill him, and your initiation into the Dark Brotherhood will be complete. Do this, and the next time you sleep in a location I deem secure, I will reveal myself once more, bearing the love of your new family." Your response to your new orders changes nothing except the nature of Lucien's reply. You have been chosen, and you are expected to perform. "Excellent! Now please, accept this token from the Dark Brotherhood. It is a virgin blade, and thirsts for blood. May it serve your endeavors well." "No? The Night Mother seems to think otherwise. Allow me to grant you a gift, in case you reconsider. It is a virgin blade, and thirsts for blood." "Please accept this token from the Dark Brotherhood. It is a virgin blade, and thirsts for blood. May it serve you well, as does your silence." "Now, I bid you farewell. I do hope we'll meet again soon." After this conversation, Lucien will hand you the Blade of Woe, a quest item you will carry for a long time to come. When questioned about the Dark Brotherhood, he will patiently explain: ""Have you not heard of the Dark Brotherhood? Of the remorseless guild of paid assassins and homicidal cutthroats? Join us, and you'll find the Dark Brotherhood to be all that, and so much more. We are, more than anything, a union of like-minded individuals. We kill for profit, for enjoyment, and for the glory of the Dread Father, Sithis. We are family, with bonds forged in blood and death." On asking of the mysterious Night Mother he will declare: "We praise our Unholy Matron. From her shadowed womb we were born, from her breast we suckle malice and pain. She loves her children, you see." You may also inquire about your upcoming mark Rufio: "Know that Rufio is old and weak, and sleeps his days away. You could kill him before he even has a chance to wake. If you so choose." If you show curiosity about his role as a Speaker in the Brotherhood, another cryptic answer awaits: "Yes, I am a Speaker, a representative of the Dark Brotherhood. My voice is the voice of the Black Hand, our organization's ruling body. One of my duties is to find exceptional individuals, such as yourself, and offer a place within our family." Asking about Rumors will have him deliver a pithy remark: "Dear Brother/Sister, I do not spread rumors. I create them." When you are ready, he will send you on your way with these final words: "Your path is clear. Send Rufio to his death, and the Dark Brotherhood will embrace you as family." He will then cast a fifty percent chameleon spell on himself and leave. When Rufio has been slain in the basement of the Inn of Ill Omen, Lucien will once again seek you out in your sleep, whispering: "So, the deed is done. How do I know this? You will find that the Dark Brotherhood knows a great many things. For you are now part of the family." "Indeed." "Now you embrace your fate." "Now heed these words." "The slaying of Rufio was the signing of a covenant. The manner of execution, your signature. Rufio's blood, the ink. As a Speaker of the Black Hand, I directly oversee a particular group of family members. You will join that group, and fulfill any contracts given. You must now go to the city of Cheydinhal, to the abandoned house near the eastern wall. Enter the basement, and attempt to open the black door. You will be asked a question. Answer thusly: 'Sanguine, my Brother.' You will gain entrance to the Sanctuary. Once inside, speak with Ocheeva. We must now take our leave of each other, you and I, for there is much work to be done. I'll be following... your progress. Welcome to the family." At this point, Lucien is ready to elaborate on the Covenant: "Know this. Every Dark Brother and Sister is a child of Sithis. He whom we call Sithis has many other names. Chaos. Doom. Discord. Sithis is the Void. We of the Dark Brotherhood serve the Night Mother, who is the bride of Sithis. The Night Mother rules her children with a terrible Black Hand. The Black Hand is the ruling body of the Dark Brotherhood. It is made up of one Listener and Four Speakers. Four fingers and a thumb, if you will. As a member of the Dark Brotherhood, you must abide by the Five Tenets. They are the laws that guide and protect us." When asked about the Five Tenets, the Speaker will lay out the governing rules of the Dark Brotherhood... and the dire consequences of breaking them: "The Five Tenets are as follows: Tenet 1: Never dishonor the Night Mother. To do so is to invoke the Wrath of Sithis. Tenet 2: Never betray the Dark Brotherhood or its secrets. To do so is to invoke the Wrath of Sithis. Tenet 3: Never disobey or refuse to carry out an order from a Dark Brotherhood superior. To do so is to invoke the Wrath of Sithis. Tenet 4: Never steal the possessions of a Dark Brother or Dark Sister. To do so is to invoke the Wrath of Sithis. Tenet 5: Never kill a Dark Brother or Dark Sister. To do so is to invoke the Wrath of Sithis." Upon further inquiry of the deceased Rufio Lucien will simply reply: "Rufio lies dead. Well done. The family will now welcome you with open arms." He will also give you a rather vivid description of Sithis: "How does one best describe our Dread Father? Imagine a perfect, cloudless midnight, cold as winter ice and shrouded in shadow. That is Sithis." Finally, he will send you to meet your new Brothers and Sisters with these words before vanishing once again: "You are now one with the Dark Brotherhood. Visit Ocheeva at the Cheydinhal Sanctuary and your new life will begin." After your slaying of Adamus Phillida, Ocheeva will welcome you back to the Sanctuary with an urgent letter for you from the Black Hand itself. The letter orders you to travel to Fort Farragut for a personal encounter with Lucien Lachance. When you arrive in his hideout, he will entrust you with a rather surprising task, an unusual way to root out the traitor who has infiltrated the Dark Brotherhood: "I have been waiting for you, assassin. We have not spoken in some time, but I am well aware of your accomplishments within the Dark Brotherhood. That is why I have sent for you. I'm afraid there is a... situation. The time has come to test both your skill and your loyalty to Sithis. The Black Hand has learned that the Dark Brotherhood has been infiltrated. By whom, and for what purpose, we do not yet know. What we do know is that there is some link between the traitor and the Cheydinhal Sanctuary. The traitor has tainted that place beyond repair. It was learned that the traitor has been active for quite some time, since before you joined the Brotherhood. That absolves you of any suspicion." "And that, dear child, is why the Black Hand has chosen you to perform the ancient rite known as Purification." "Oh, but I do. You have been selected by the Black Hand to perform the ancient rite known as Purification." "Listen well, child of Sithis. You have been chosen to perform the ancient rite known as Purification." "Everyone inside the Sanctuary must die! You must break one of the Tenets you have sworn to uphold. I know this is an unexpected turn of events, but drastic measures must be taken. Ocheeva, Vicente Valtieri, Antoinetta Marie, Gogron gro-Bolmog, Telaendril, M'raaj-Dar and Teinaava. All of these family members must die! From this point forward, you are no longer bound by the Five Tenets! Sithis will forgive any murder, any theft, so long as you serve the Black Hand! When the rite of Purification has been completed, return to me here at Fort Farragut, and we will discuss your future. Now, take these special gifts. They will help you greatly. One is a poisoned apple. The other, a unique scroll of summoning. Good luck... Silencer." When asked about the Poisoned Apple Lucien will explain: "The apple has been treated with a most deadly poison. It will likely kill whomever eats it, probably instantly. To use the apple, simply dispose of any other food and put the apple in its place. If someone is inclined to eat, and they taste the apple... death." Questioning him about the Purification results in a brief lesson on the history of the Dark Brotherhood: "The Dark Brotherhood is an ancient organization. We have survived for millenia. Sometimes, to ensure that survival, drastic measures are required. The Purification is one of the most extreme measures we are forced to carry out. Indeed, it has only been carried out twice. Before now, that is. The Five Tenets are the laws that guide and protect us. But, sometimes, even they must be broken to protect the sanctity of our beliefs. With a Purification, we cleanse the Dark Brotherhood of mistrust and treachery. Those who are slain are offered to Sithis as a symbol of fealty. And, hopefully, we kill the traitor in the process. Until the Purification is complete, no given Sanctuary will ever be considered secure." Finally, he will shed some light on the Unique scroll of summoning if you ask: "You of course recall Rufio, the feeble old man I sent you to kill when we first met? He was weak in life, but his spirit is quite angry in death. The scroll will allow you to call upon Rufio's angry ghost for assistance. He will appear, unleash his anger upon your foes, and then disperse." The Speaker will then send you on your way to the Sanctuary with the words: "Make haste! The Sanctuary must be Purified, if this treachery is to be undone!" Should you require more information from Lachance, he will remain in his sanctuary awaiting news of your success. "The ritual of Purification is complete. Well done. Sithis has been appeased, and the time has come to acknowledge and reward your unwavering loyalty. The Black Hand is most pleased with your progress. You have been invited to share in secrets that few within the Dark Brotherhood even know exist. Your life in the Sanctuary is over. Those contracts are behind you. Now, you will serve the Black Hand. You will serve me. From this moment forward, you will walk the shadows as my Silencer. You will receive contracts only from me. Your new life has begun." "Hail Sithis indeed, my child! Now listen closely." "Now you embrace your fate." "Listen well, child." "No longer will you receive orders directly. Instead, you will visit dead drop locations scattered throughout Cyrodiil. Your next contract can be found at the dead drop on Hero Hill, southeast of here. A hollow in the moss-covered rock contains all you need to know. When you leave here, we will not speak again, unless I deem it necessary. Ah yes, there is one last thing. I have for you a very special gift. Waiting just outside is a magnificent steed named Shadowmere. She has served me well. I present her now to you, as a token of my trust and love. Now go, and may Sithis guide you in this new stage of your life's dark journey." When asked for more detail on the rank and role of a Silencer Lucien will respond: "The Black Hand is the Dark Brotherhood's ruling council. That hand consists of four Speakers and one Listener. Four fingers and a thumb, as it were. This you already know. What is not commonly known among our family members is that the Black Hand employs a few... additional numbers. As every hand has fingers, does not every finger have a nail? A claw? A talon? Every finger of the hand, every Speaker, has such a nail. These are the Silencers. Each Speaker employs his or her own private assassin, to extend their reach and strike forth as necessary. My previous Silencer perished while fulfilling a contract. That emptiness has now been filled by you. It is an honor without equal." 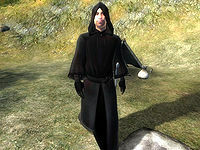 He will send you, his new talon, back into the world with: "Go now, Child of Sithis. Walk in the shadow of fear, and bring glory to our Dread Father." Lucien will remain in the fort, ready to provide what assistance he can, until you begin your first dead drop mission for him, at which point he will disappear from the game for the time being. After you have slain Ungolim, a furious Lucien Lachance will run up to you, realizing that he has failed to prevent your latest murder: "No! No, I'm too late! I thought I could get here in time, thought I could stop you! By Sithis, what have you done? What madness has claimed you? You have betrayed me, you have betrayed the Dark Brotherhood! Why? I am here to end your miserable life, to... But... I can see the confusion in your eyes. You... You have no idea what I'm talking about, do you?" As always, you are presented with three options, but this time all of them will cause Lucien to reveal the truth about your killing spree: "Your first dead drop contract, you carried that out, killed Celedaen. After that, you eliminated the Draconis family, as ordered. Then, betrayal! Your dead drops went unvisited, your targets ignored. Instead, you have been systematically killing off all the members of the Black Hand! J'Ghasta, Shaleez, Alval Uvani, Havilstein Hoar-Blood -- Speakers and Silencers all. And Ungolim... the Listener himself! The surviving members of the Black Hand know that you're innocent, they know you were only following orders. They believe I am the traitor!" Again, three options are available to you, but all will result in Lucien asking you to figure out who the real traitor is: "The traitor somehow switched your orders, and has been sending you to the wrong dead drops. You and I have been deceived, dear friend. We must find out who is behind this betrayal! We haven't much time... I am hunted day and night by the Black Hand! They want me dead! Here is what you must do. Go now to your next dead drop, lie in wait, and confront whomever drops off the false contract! Uncover the true traitor's identity, and then come see me. I'll be in hiding. Fort Farragut is no longer secure. It's under watch by the Black Hand. I'll wait for you at Applewatch, the farm where you killed the old Draconis woman. It should be empty, and safe. Now go! And may Sithis help us all!" Asking him about rumors will have him angrily claim that he doesn't have the time for gossip: "Are you mad? My life is on the line and the entire Brotherhood is at stake! We don't have time for this nonsense!" He will exit the conversation with: "Go now! Learn the identity of the betrayer so we can end this madness, and restore the authority of the Black Hand." before camouflaging himself again and running off to the farmstead. If you decide to visit Lachance at Applewatch before having investigated further, an annoyed Lucien will scold you, saying: "You return to me, yet you bear no news? Go, Silencer, uncover the identity of the traitor! The fate of the Dark Brotherhood rests in your hands!" This will be the last time you ever see Lucien alive. When you arrive at Applewatch with the evidence to exonerate Lucien, expecting to see your patron, you will instead be met by Arquen and the macabre sight of Lucien's tormented corpse dangling from the ceiling. Arquen will fill you in on what she believes is the truth about the traitor: "Silencer! At last you've arrived! Fear not, for the crisis that has threatened the Dark Brotherhood has finally come to an end. I am Arquen, Speaker for the Black Hand. As you can see, we have dealt with the betrayer, Lucien Lachance! No longer will you serve as his puppet! It seems Lachance wanted revenge against the Dark Brotherhood for some reason, and used you to do his dirty work. But now, we can begin anew! I bestow upon you the title of Speaker. You will take Lucien Lachance's place on the Black Hand! Welcome!" Mathieu Bellamont: "You should take some time to admire his corpse. It really is a thing of beauty. The punctures and slashes are almost... poetic." Banus Alor:"The four of us attacking him in unison was as graceful and beautiful as a ballet! The flashing of steel, the spraying of blood!" Arquen: "When we confronted Lachance he tried to defend himself, tried to declare his innocence! But we would not hear his treacherous lies! As you can see, he was no match for the combined power of the Black Hand, even weakened as we are." Belisarius Arius: "Most of my time is now spent on administrative duties. I have not had blood on my hands in far too long! Killing Lachance was pure ecstasy." Later on, during the quest Whispers of Death, a rather macabre rumor will spread amongst the new recruits in the Sanctuary: "I... I heard what they did to Lucien Lachance... Is it true that Arquen feasted on his entrails?" During the Honor Thy Mother quest, when you enter the Crypt of the Night Mother with Arquen and the other Black Hand members, the Matron will angrily listen to Arquen's statement: "The traitor is dead, dear Mother. We have come now to ask your blessing. Anoint one of us your Listener, so we can restore the Black Hand!" The Night Mother will then reveal Lucien's innocence by saying: "Foolish little girl. Lucien Lachance served Sithis til his dying breath. The Black Hand remains tainted by betrayal. Restoration is impossible." This statement will cause Mathieu Bellamont to draw his weapon and reveal himself as the traitor: "Enough! Enough of this! You will all suffer for the pain you have caused me! I will destroy your Night Mother, and the Dark Brotherhood will fall!" A sad poem in Mathieu's diary will tell what led to Mathieu's treachery and the demise of Lucien Lachance: "father prayed and guess who came the hooded man in Sithis' name who left but then he came once more to pass through window wall and door I lie in fear my mouth agape as wicked blade did cleave your nape for I was watching 'neath the bed to see the falling of your head and when your face lie on the floor our loving eyes did meet once more and so I pledged to you that day the Brotherhood would dearly pay and just as they took me from you I'd find and kill their mother too but there's someplace I need to start and that's with father's beating heart and when that's done I'll sing and dance to celebrate a dead LaChance". In the game, it is stated that Lucien is a Speaker of the Black Hand. However, in the construction set, Lucien is only listed as a Murderer in the Dark Brotherhood. The information listed in the summary box is the construction set faction, because this is the information that controls the NPC's disposition, dialogues, and responses to scripts; see Factions for details. There are actually two different versions of Lucien. Up until the final Dark Brotherhood quest you interact with the character internally identified as "LucienLachance" (RefID 0002FD77, FormID 000224ED). In the final quest he is replaced by "LucienLachanceHunted (RefID 000034B0, BaseID 000034AF). The two characters have different statistics and different scripting. There is a spell you can get by completing a quest for the Dark Brotherhood in Skyrim that allows you to summon the ghost of Lucien Lachance. When asked about "Rumors" in his initial contact with you, he will respond with the standard, "Dear Brother/Sister, I do not spread rumors, I create them." dialogue even though you are not yet a member of the Dark Brotherhood. With Knights of the Nine installed, his response will be replaced with the rumor regarding the attack on the Anvil Chapel. While you are on the quest Through A Nightmare, Darkly, Lucien can appear in the Dreamworld. Esta página foi modificada pela última vez à(s) 18h00min de 5 de janeiro de 2016.